From Whalley Range to London via Stockport! That's four boardrooms I'm in now! Last week I took six framed posters to JL Advisory LLP, an accountancy firm in central Stockport. This picture shows the three landscape shaped posters, while the portrait shaped ones are out of shot. The partners picked the images according to where they all live, hence the Heatons, Whalley Range, Stockport and Poynton. They added the Manchester Powerhouse and London posters just because they liked them, I presume. 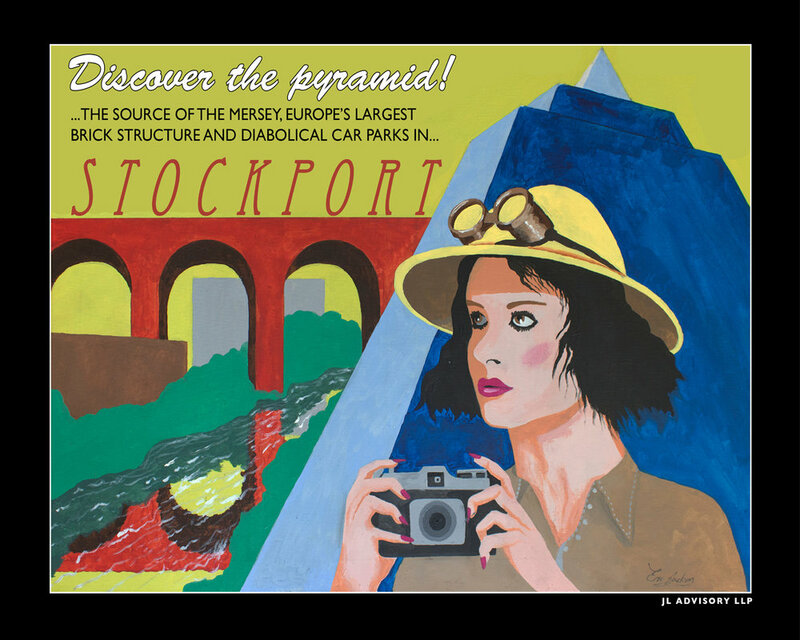 I actually customised all the posters to include the company name, which is shown on the Stockport poster below. Thanks ladies, great doing business with you. Most of my posters and associated products are usually bought by individiuals, but occasionally i get orders from firms in the region. Recently it was my pleasure to supply a number of framed posters to Niche Consulting in Eccles, a company that specialises in health and social care work. I dealt with one of the partners, Kate Jury, who had previously bought some smaller works off me at the Treacle Market in Macclesfield. When I called at the offices, I found Kate and the rest of the firm really welcoming and enthusiastic about my posters. Says Kate: "We were in the process of trying to give our office a new 'identity' and found Eric's artwork by chance. We knew instantly that his work would be perfect for us and we love the way that he pokes (always kind) fun at suburban characteristics in and around Manchester and the North. "The really difficult thing was trying to choose which pictures to buy as we could have bought the entire back catalogue! In the end it came down to a vote and purchased 8 large ones and 3 small ones - we are delighted with how they look. "Eric also provides superb customer service and, if you get chance to have a cuppa with him, he is a fantastically interesting fellow with some great insights and stories". The feeling was entirely mutual. Such a fabulous bunch of people!